For centuries, individuals have been striving to develop a closer relationship with God. In our zeal to achieve such a connection, we often times find ourselves influenced by new trends, dynamic personalities or even exotic faiths and teachings. We seem to be searching for that 'missing' element in our life that would allow us to 'feel' closer to God. The Orthodox Faith has within its essence, the means by which one can achieve a more intimate relationship with God. This does not simply occur by sprinkling some type of 'secret ingredient' into the 'recipe' of our life, but rather occurs through the nurturing of many individual acts and deeds over time. As Christians it is important to remember the teachings of Saint Paul and strive to "pray constantly" (Thessalonians 5.17), for it is through prayer and meditation that one becomes closer to God. Saint Paul's seemingly simple instruction however, seems to bring about a whole new set of questions. How do we pray? When do we pray? Must we speak in special tongues? Do we have to recite long texts or prayers? When we pray – how should we pray? How does one pray constantly? All of these are very fair questions which have been addressed and answered by the Fathers and Saints of our Church. yet, one of the most important. The Desert Fathers remind us that it is very difficult to recognize our sins when we are caught up in the turbulence of the day, but when we have an opportunity to be quiet and reflective in prayer, we are able to recognize our faults and seek forgiveness through Christ.4	In order for us to communicate with our Lord in prayer, we must be attentive, alert and able to listen. One of the greatest obstacles facing society today is that we are unable to separate ourselves from the 'world' and listen to God's voice. "Lord Jesus Christ, Son of God, have mercy on me a sinner." It is through prayer that we are called to recognize God's voice, to the point where we no longer question whether it is the voice of God or not. Not in the same sense of being able to distinguish our friend's voice on the telephone, bur rather a deeper distinction, an inner devotion or prayer, a 'prayer of the heart.' The 'prayer of the heart,' according to Saint John Climacus is the "stretching out of the hands, the beating of the breast, the sincere raising of the eyes heavenward, deep sighs and constant prostrations. "5	It is unfortunate that many of us are still unaware of the presence of the "innermost sanctuary of our heart. "6 True prayer is the acceptance and feeling of this inner presence and activity. Yet, how do we learn to listen, and allow our prayer of words to develop into a prayer of silence? How do we rediscover, through prayer, Christ's existence in us? "Lord Jesus Christ, Son of God, have mercy on me a sinner." When we begin to develop our prayer life, we must begin with a positive attitude, understanding the many blessings that God continues to bestow upon us and ultimately that 'every good and perfect gift is from above. '7 This acknowledgement will assist us in gaining the proper frame of mind to establish an open and comfortable relationship with God. Take for example, the account offered to us by Saint Evagrios, when he points out that "when Moses tried to draw near to the burning bush, he was forbidden to approach until he had loosed his sandals from his feet. If then, you wish to behold and commune with Him who is beyond sense- perception and beyond concept, you must free yourself from every impassionate thought. "8 We must also free ourselves from every impassionate thought when we pray and communicate with God. "Lord Jesus Christ, Son of God, have mercy on me a sinner." The Jesus Prayer can be incorporated in both a free style and formal style of worship. This free style of worship refers to the simple and flexible structure of the prayer that can assist in making our prayer life more potent and provides us with a transition from personal prayer to communal prayer in Church. The formal style of praying the Jesus Prayer requires one hundred percent of a person's attention. It is this type of recitation that is associated with time that has specifically been set aside during the day to pray to the Lord. "Lord Jesus Christ, Son of God, have mercy on me a sinner." If we examine the Jesus Prayer from a theological viewpoint we may recognize that the prayer contains two chief mysteries of Christianity. "It speaks first about Christ, in the Incarnation by the name Jesus, which was given to him by the angel Gabriel; and in the Trinitarian name 'Son of God.' This qualifies the Jesus Prayer as being both Christocentric and Trinitarian. "15 As a devotional prayer, the Jesus Prayer deals with a celestial love of God as well as a heavenly mercy or piety. In the first section of the prayer, we praise God as 'Lord Jesus Christ,' expressing our faith and exalting Him as our Lord and Savior. In the second section of the prayer we seek repentance when we say "on me a sinner." The word that unites these two important aspects of prayer is that of 'mercy,' which combines the vision of divine glory and the consciousness of human sin.16 When we pray for God to 'show us mercy' we admit our own helplessness while at the same time voicing our cry of hope. "Lord Jesus Christ, Son of God, have mercy on me a sinner." The invocation of the Name occurs through our repetition of the Jesus Prayer, and seems to establish a form of tranquility within the body. Bishop Theophan taught that in order "to stop the continual jostling of our thoughts, we must bind the mind with one thought, the thought of One only." When we pray, it is difficult to stop thinking, however, we need to try to fill our minds with good thoughts. The Jesus Prayer allows us to do just that. It provides us with the opportunity to turn our thoughts away from earthly concerns and simply focus on God. Through the discipline of repetition, our focus slowly begins to shift heavenward. 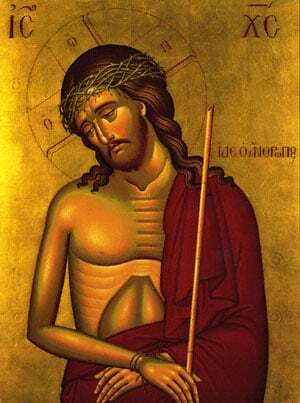 "Lord Jesus Christ, Son of God, have mercy on me a sinner." The Jesus Prayer, begins as an audible prayer of the lips. In time, it passes beyond the lips, and develops as an inner prayer. "Lord Jesus Christ, Son of God, have mercy on me a sinner." With each repetition of the now silent prayer, our mind and intellect become more involved in our conversation with God. Our prayer becomes more involved, intense, and spontaneous, to the point where we are no longer reciting the prayer simply with our mouths. "Lord Jesus Christ, Son of God, have mercy on me a sinner." We begin to arrive at the point where the prayer descends to the heart. Not the heart that signifies emotion and affection, but that which Boris Vysheslavtsev describes as "the center not only of consciousness but of the unconscious, not only of the soul but of the spirit, not only of the spirit but of the body, not only of the comprehensible but of the incomprehensible; in one word, it is the absolute center. "20 Therefore in order for us to find the true essence of prayer we must allow it to reach the 'absolute center' of our heart. In doing so we will discover that the Jesus Prayer becomes not simply a prayer of the heart but a prayer of the mind and intellect as well. "Lord Jesus Christ, Son of God, have mercy on me a sinner." The prayer of the heart needs silence and peace. Everything within us and surrounding us must be still and focused. As we begin to strive for this attitude of vigilance and attentiveness, we may begin to experience an inner peace. It is in this tranquil state that the name of Jesus will begin to reside in the innermost chambers of our heart. "Lord Jesus Christ, Son of God, have mercy on me a sinner." Athanasius. The Life of Antony and The Letter to Marcellinus, New York: Paulist Press, 1980. Brianchaniniov, Ignatius. On The Prayer of Jesus, London: Robert Cunnigham and Sons LTD, 1965. The New Oxford Annotated Bible, New York: Oxford University Press, 1977. Climacus, John. The Ladder of Divine Ascent, New York: Paulist Press, 1982. French, R.M. The Way of the Pilgrim, New York: Harper & Row Publishers, 1981. Maloney, George A.. The Jesus Prayer, Indiana: Ave Maria Press, 1981. Monk of the Orthodox Church. The Jesus Prayer, New York: St. Vladimir's Press, 1987. Palmer, G.E.H., Sherrard, Philip, Ware, Kallistos. The Philokalia, Volume 1, Boston: Faber and Faber, 1979. Payne, Robert. The Holy Fire, New York: St. Vladimir's Press, 1957. Symeon. Symeon The New Theologian The Discorces, New York: Paulist Press, 1980. Vogel, Anthony A. The Jesus Prayer For Today, New York: Paulist Press, 1982. Wadell, Helen. The Desert Fathers, Michigan: University of Michigan Press, 1957. Ware, Kallistos. The Power of the Name, Oxford: SLG Press, 1974. Wheeler, Eric P.. Dorotheos of Gaza, Michigan: Cistercian Publications, 1977. Winkler, Gabriele. The Jesus Prayer in Eastern Spirituality, Minnesota: Light and Life Publishing Company, 1986. Winkler, Gabriele. Prayer Attitude in the Eastern Church, Minnesota: Light and Life Publishing Company, 1978. Photos included in Jesus Prayer article courtesy of P. Gagianas, M.D.